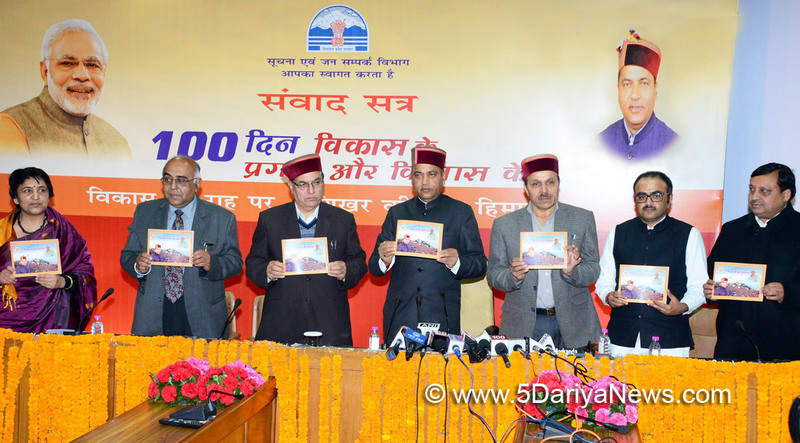 The Himachal Pradesh government will soon formulate new policies on power and mining while steps have been initiated to boost the hill state's tourism potential, Chief Minister Jai Ram Thakur said on Monday. "We will soon bring a new mining policy to ensure more revenue and end illegal quarrying. The policy is in the final stages of preparation and will have penal provision of jail for two years and fine up to Rs 5 lakh for offenders," Thakur told reporters here.Listing the Bharatiya Janata Party government's "achivements" on completion of 100 days in office in the hill state, the Chief Minister said a new policy to facilitate tapping of hydro-electric generation would also be formulated.He also said that the government will act tough against corruption and a Lokayukta would soon be appointed. "Hundred days is too short a time period to perform or evaluate the performance of any government. But we have initiated immediate steps to give direction to the state. The results will come in times to come," he said. "We have tried to focus our policies on all sections -- farmers, fruit growers, women, the senior citizens. We have simultaneously launched 30 new schemes," he added. Thakur said the state government will have a clear focus on tourism promotion as well. "We have allocated funds for development of tourism infrastructure in the state," the Chief Minister said. "As much as Rs 100 crore has been earmarked for maintenance of roads and Rs 50 crore for promoting unexplored tourist destinations. "We have set 472 targets on the basis of a public feedback and fixed time frames to achieve them," he added.Thakur also said that other initiatives included reducing the age for social security pension from 80 to 70 years, granting monetary benefits to employees and pensioners, ensuring women's security and mobilising funds for water supply schemes despite the state's debt of Rs 46,500 crore.Thakur and his 11 Ministers, half of them first-timers, took oath of office on December 27, 2017 after the BJP won a majority with 44 seats in the 68-member Assembly. The Congress won 21 seats, Independents two and the Communist Party of India-Marxist one.